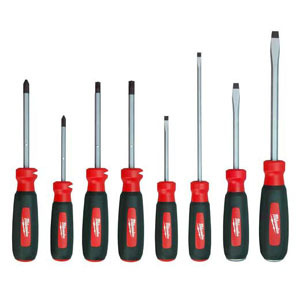 In addition, each screwdriver shaft is made of shock resistant steel for added durability and the bit type is clearly marked on the top of each handle for quick identification while in a tool belt. For further utility, an integrated wire stripper and wire bending hole allow the user to strip and/or bend up to 12 gauge wire before fastening to electrical boxes. Clearly the folks at Milwaukee have created this set of screwdrivers for electrical contractors and DIY’ers that perform electrical work. As you can see in the photo above some of these new screwdrivers come with a handy integrated wire stripper and wire bending hole. One feature that I really enjoyed was the new ECX™ bits that fit into specialty screws that are showing up in electrical devices. I used these new screwdrivers on our recent kitchen backsplash project that required new electrical outlets and those new bits make a huge difference. This is a really nice set of screwdrivers especially if you’re in the electrical profession. The hardened tips, comfortable grips and bit type markings on the end make this a great set. The new ECX™ bits really impressed me when working with electrical outlets. If you’re in the market for a new screwdriver set then give this one a fair shot.